There will also be a $160 visa charge for a Bolivia visa. This Junior’s Abroad trip is built around the natural and cultural diversity of the high Andes in Peru and Bolivia. On this trip the students will experience the alpine forests of the Andes, the high-plains Altiplano, the Salar de Uyuni (“salt desert”) of Bolivia, and Lake Titicaca (the world highest fresh water lake). A highlight of the trip will be the opportunity to walk a portion of the Inca Trail from Cusco to Machu Picchu. Students will also learn about and experience the cultural diversity of this region, a diversity that encompasses both the past and the present. Our journeys will put us in touch with the pre-Columbian Incan and Tiawanaku cultures as well as the modern, indigenous Quechu and Amaran groups. Our interactions with culture will also involve the dominant Spanish culture. Our interactions with the various cultures will take us from the modern cities of Lima, Peru and La Paz, Bolivia to the remote, highland villages of the Andes. Along the way we’ll have the opportunity to interact with the local people at churches, markets, and cafes. Along with the study of the ecology and culture of Peru and Bolivia this course will also meet several other goals. The first goal is to examine the cultural and environmental impacts of colonization, mining, industrialization, and tourism. The second goal is to learn how Christianity brought by the Spanish combined with and was assimilated by the original local religions. The third goal is to better understand the work of modern Christian missionaries in this part of the world. Our group will connect with mission groups during our travels in Peru and Bolivia to learn about their work. We will begin our exploration of this region in Lima, Peru. Whilst in Lima we will begin our interaction with the ancient Incan culture by visiting the Museo de la Cultura Peruana and the Museo Oro de Peru. Both museums contain a number of artifacts from the Incan civilization. From Lima we will fly to Cusco, the capital of the Incan civilization. We will spend several days in the Cusco area visiting Incan sites and exploring the local geography. Part of these experiences will involve biking through the Andes. Our group will then depart for a four-day trek through the Andes to Machu Picchu, the lost, mountain citadel of the Incas. On our trek students will encounter a number of Incan ruins as well as indigenous villages. 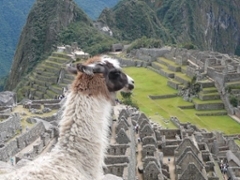 From Machu Picchu we will return to Cusco before departing for Lake Titicaca and Bolivia. In La Paz we will visit the Tiawanaku ruins. We will also connect with a Friends church that has strong connections to the Northwest Yearly meeting and George Fox University. From La Paz we will travel south to Potosi and the southern Altiplano. Our journeys here will take us to the Salar de Uyuni, the worlds-largest salt flat. We will spend three days experiencing the high peaks, hot springs, volcanoes, and rock gardens of this region. Returning to Potosi, a World Heritage site we will visit the silver mines that enriched Spain during colonization. We’ll also tour the Casa de la Monda, which was the South American mint for Spain during colonial times. Special Note: This is an adventure Juniors Abroad trip that will include hiking, biking, and camping in the high Andes. Thus, participants must be in good physical condition. The hiking involves a four-day trek. On some days we will surpass 14,000 feet in elevation. Camping will involve sleeping in tents on the ground, primitive toilets (holes in the ground at times), and cold showers (if they are available.) Even though the majority of the mountain biking is downhill, it will be at high altitude. To participate in this course students will be required to be cleared for these activities by the George Fox Health and Counseling Center. DAY 16 Visit to Salar de Uyuni.